'Il Duce', Benito Mussolini, was one of the key figures in the creation of fascism. Famed for his dictatorial style, his political cunning and admired - initially - by Hitler, Mussolini led the National Fascist Party and ruled Italy as Prime Minister from 1922 until his ousting in 1943. In so doing, he paved the way towards Italy's defeat in World War Two, and some of the 20th century's most destructive ideologies and practices. Following expulsion from Italian Socialist Party, Mussolini denounced all efforts of class conflict, and instead later commanded a Fascist March on Rome to become the youngest Prime Minister in Italian history. Thereafter he set about dismantling the apparatus of democracy and initiated what would become known as the one-party totalitarian state. With World War II came defeat, humiliation and his bloody deposing. 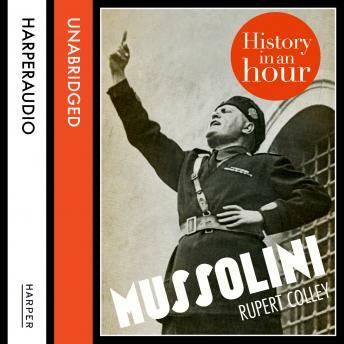 Explaining his ideologies, policies, actions and flaws, 'Mussolini: History in an Hour' is the concise life of the man whose ideas helped create some of the worst horrors of the modern history.